Thursday was our North Shore day. Our tentative plan was to stop at some of our favorite places (for both food and scenery). First stop was Giovanni’s shrimp shack in Kahuku…quickly followed by delicious corn on the cob. We continued on to Haleiwa..and along the way we stopped at one of the beaches for our third monk seal sighting of the trip! Waves were washing over him and he didn’t care. We made it to Haleiwa (which has changed quite a bit..new shops, restaurants, etc). 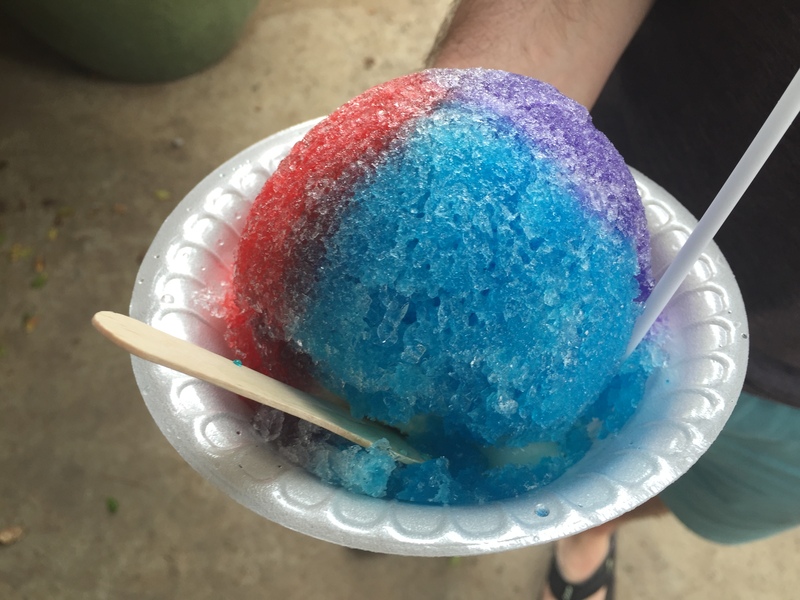 Even with all of the new stuff to choose from, we decided to share a Matsumoto’s Shave Ice. After walking around and enjoying Haleiwa, we started our way back to town. On our drive back we saw yet ANOTHER monk seal..making our total for the trip four! Which is a lot considering they are critically endangered with about 1,100 left. We also got a glimpse of Sacred Falls on our drive back! Sacred Falls wayyyy in the distance. We made it home to shower, change and make the sunset at the Tantalus lookout. It was a bit cloudy, but we still got some great pictures. After a beautiful sunset, we met Kevin, Saki and Kion (Kevin is Josh’s friend from the Marines) for dinner at Sweet Home Cafe. 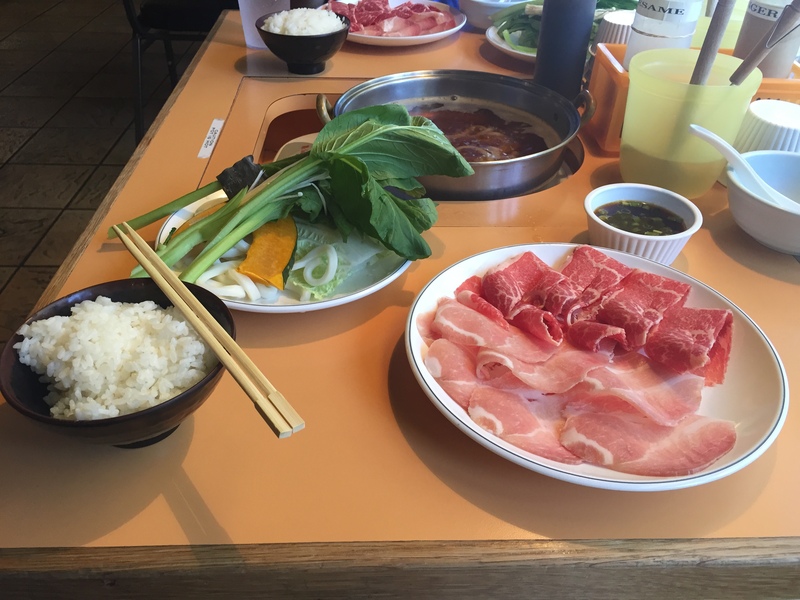 The restaurant is a Taiwanese-style hot pot and shave ice place. It was absolutely delicious! You go to this fridge and pick out everything you want on plates. Then toss it all in a bowl. And you the have deliciousness! On Friday, our last full day there, we hiked the Hanauma Bay ridge. This was another new hike for us and it completely blew away all of our expectations. It was a gorgeous day and we could once again see Molokai, Maui and Lanai. I think the pictures will do a better job of describing how gorgeous it was! The waves were quit insane…Josh took an awesome video! Two people went out there and stood on this while we were there. Stupid. The guy who just wanted his picture taken. I was much slower than Josh…obviously. After that incredible hike, we drove around the east side of the island for the last time and got some poke at Hibachi again in Kailua. 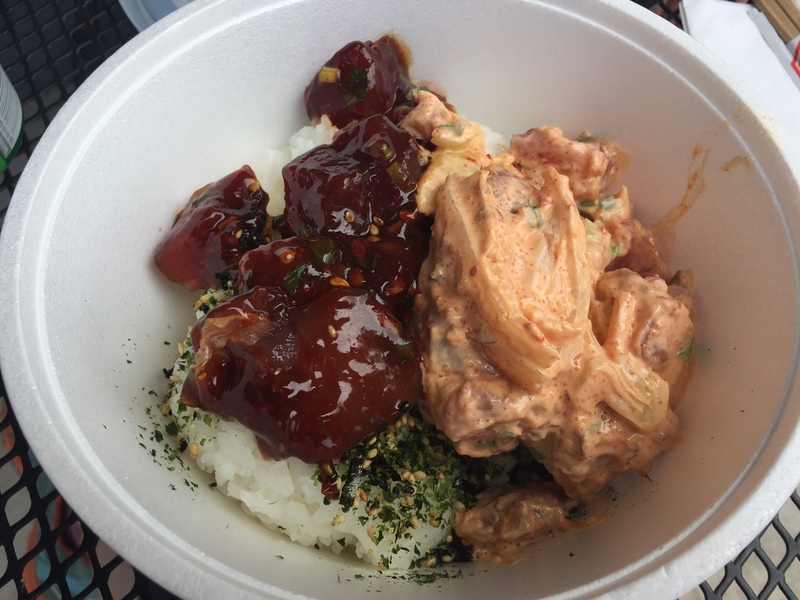 After my last poke bowl, we went back to our apartment to shower, change and get ready for dinner at Duke’s! 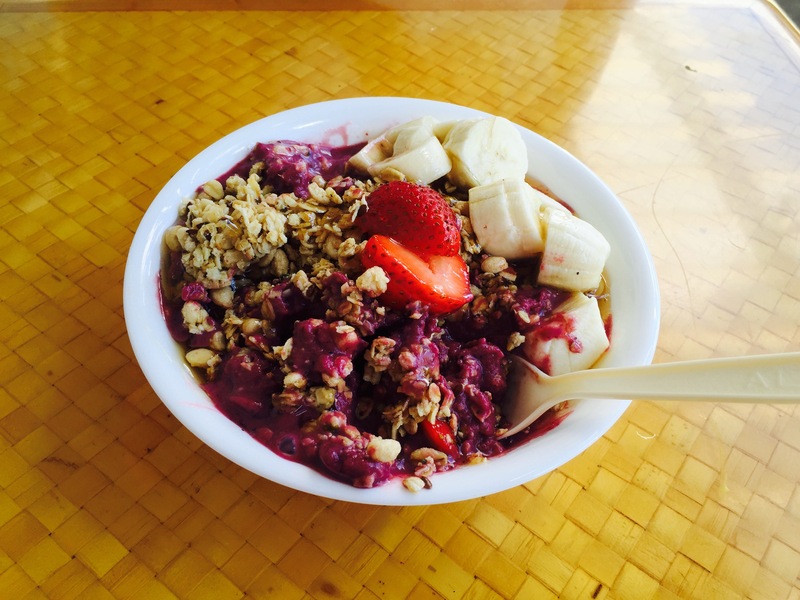 On our last day (so sad), we checked out of our airbnb at 10:00 AM and went to Diamond Head Cove Health Bar for one last açai bowl. After enjoying the deliciousness, we drove around the area a bit checking out all of the cool houses and then had an early lunch of Shabu Shabu (my fave). This entry was posted in Adventures, Bon Appétit and tagged açai bowl, adventure, art, beach, beaches, Corn, Duke's Waikiki, food, friends, Haleiwa, Hanauma Bay, Hanauma Bay Hike, Hawaiian Monk Seal, hawaiian outdoors, Hibachi, hiking, Honolulu, hot pot, island life, Matsumotos Shave Ice, Monk Seal, North Shore, Oahu, ocean, poke, rock bridge, shabu shabu, Shave Ice, Shrimp, Sunset, Sweet Home Cafe, Taiwanese hot pot, Tantalus, Tantalus Lookout, Waikiki by sandersnm. Bookmark the permalink.